If you’re of a certain age and you lived through the 1980’s, it’s likely that you wore the collar of your polo shirt flipped up. Or maybe you even layered two shirts together to get the collars to stay up in just the right way. Collar trends have come and gone over the years, but one thing is consistent: a collar is a finishing element to a garment, adding both finesse and refinement. For as long as there have been knit shirts with collars, the menswear industry has struggled to keep those collars from rolling up or under. Even knitwear considered high end—offered by luxury brands—suffers from the same rolled-collar malady. Except for St. Croix clothing of course. About ten years ago, St. Croix Collections Founder, Bernhard Brenner, was visiting with a customer from Detroit, who again reminded him how frustrating the inconsistent collars could be. Mr. Brenner, a perfectionist at heart, took up the challenge to eliminate the issue of knit collars not laying flat. It took about 18 months to develop the final solution and refine the manufacturing process. Working closely with the Designers and the Knitting Engineers, Mr. Brenner and team developed a proprietary process by which a Teflon stay (that is 5/1000 of an inch thick) is knitted into the polo collar, preventing it from curling, and providing stability and a perfectly flat collar never before possible. It never rolls up, under, or any other direction—it always lies flat. The Teflon stay can withstand nearly any temp, so washing and drying does absolutely nothing to decrease its effectiveness and durability. The team at St. Croix built one knitting machine to use for the special purpose of making flat collars, and launched this new innovation with just one shirt. 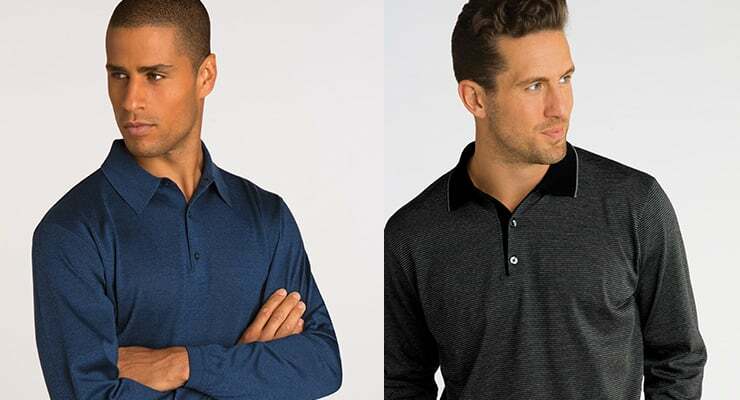 Today, all knit shirts with a polo-style collar have this special process, and the company has about 10 machines in use manufacturing the flat collar knitwear for our customers. This unique process is exclusive to St. Croix—making their knitwear a stand-out in the industry. It’s one of the special selling features of these garments. Sometimes marketing features don’t deliver on their promises, but this is one feature that stands out, and nearly makes the shirts sell themselves. Because of this uniqueness, these are some of St. Croix’s best selling shirts. And beyond the lay-flat collar that looks great, the durability of the garment keeps customers coming back for more. “This item doesn’t fade, doesn’t shrink, and it wears so well,” said Tim. “It’s really a tremendous benefit when you sell a high quality item that it actually lives up to the hype. It makes selling easy!” Tim shared. Every season, St. Croix Collections introduces an assortment of knitwear featuring the exclusive lay-flat, never-roll collars. See the difference for yourself at a retailer near you!